I blame that fellow Bob Cordery. 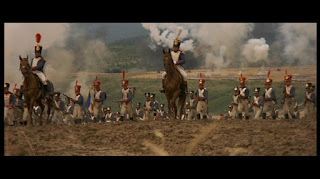 No sooner had he posted on his blog - Wargaming Miscellany - about the 20th March being the anniversary of the start of the Hundred Days campaign in 1815 (coinciding with watching the film Waterloo again) than I thought to myself 'Wow! That is a good idea!' and duly downloaded my ITunes copy to watch on the train. There is little to be said about the film and I am pretty sure I could not anything new to the general opinion of it among the wargaming fraternity. It did jog a lot of very happy memories for me though - more so given my recent reorganisation of the man cave and my collections. I kept the 1815 section of my library intact and if pushed into corner would happily dabble in the period again in some fashion. My fondness for the campaign has been a constant companion over the years and whilst other periods have come and gone it has remained - lurking in the background for sure but always there. Originally the units were organised as per the Airfix Magazine Guide by Bruce Quarrie on the Napoleonic Wars so the guard and highland regiments were 30 figures and the other infantry were 20 strong. Cavalry were 12 figures and the artillery was a gun and four gunners. So, 222 foot, 30 mounted (including 6 mounted officers/general - again conversions) and three guns in total. I fought many dramatic actions with these figures against my friends French Army but sadly there are no surviving photos. Wonderful. I never quite got to the that number of figures and now seem to have mainly Highlanders in my Airfic collection. But at the time I had lots of bits of card with the exotic, and surely badly spelled, unit names written on them. As I recall my friend and I would only use painted figures despite both of us having thousands of unpainted Airfix soldiers. This was needed in order to get the right quantities of figures in the correct poses. It was glorious fun but we never went down the cardboard figure base route - ironically though my block collection des exactly that!